Been quite a while since I posted here, well, I’ve been enjoying the room! For various reasons, I had been tweaking the room settings, and the room’s bass performance had drifted off of optimal. Bruce Thigpen was stopping by the SF Bay area anyway, so I invited him over to retune the room. In addition to checking and adjusting EQ to obtain a flat frequency response curve, we decided to also get at another very important tuning exercise – timing. Why timing? I had visited another media room in the area, and was impressed by how great his movie experience was with much less subwoofer output than mine. Listening to Master and Commander’s cannon shots, I immediately came to understand why. I heard a room with speakers and subwoofers aligned in the time domain as well as the frequency domain. In a media room, especially mine, where sound processing for the woofers go thru an extra signal processing chain, in this case the Lake EQ/crossover (see earlier post), the woofer signal can be delayed relative to the mid to high frequency sounds that are not going thru the Lake. We took a stab at what these processing delays might be, and we subjectively felt we improved the sound, but a more technical measurement of a room impulse response would give us more accuracy. We left this to a future tuning exercise. We really cannot conclude at this time that the Lake processing delay was perceptible or not. 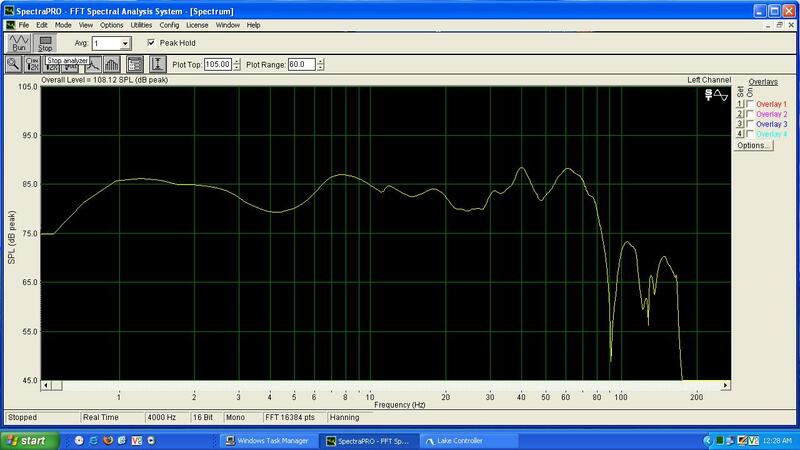 Looking at the room’s frequency response, turning back to the frequency domain, we did see that the TRW’s were putting out too much bass. Yes, too much bass. How can there be too much bass you might ask, especially since I went to all the pain to add more and more subwoofers to the room. Turns out that large SPL of <20Hz were masking out the ear’s perception of 20-100Hz, where alot of sound effect (that I’m interested in) exists. So in the end, we tuned down the TRW output, yet resulting in a far more pleasing and emotional sound effect experience. I use the word ’emotional’ several times, because the best movie sound effects are those that put the chill up your spine, or raise your hair on your arm or back of the neck. We’ve had plenty of those experiences when things are right in our media room. But just get things slightly out of tune, and it can be loud and clean, yet not emotional. Maybe realism is the key factor creating emotion, the sense of actually being inside the movie, versus watching it from the other side of the screen. Shown here is the final room response, at the seating position… ignore above 80Hz, since the mains and center channel were not producing the pink noise signal, hence only the subs were pumping out the sound. Glad to see this blog active again.